A casino that is not recommended by our expert reviewers. Sorry, this casino is not recommended by our professional reviewers. Check out our top casinos. Lucky Red Casino accepts players from all around the world including the US. The site runs its casino off software provided by Real Time Gaming, one of the most respected brands in the business which has proven playability and fairness. 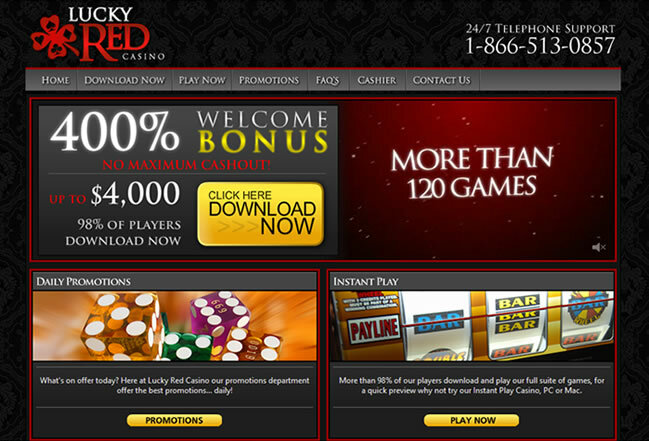 In this review of Lucky Red Casino, first up is a brief overview of the company. Then the Craps offering is covered, looking at its design, playability and features. Next you can find the bonuses and other games provided by Lucky Red before checking out the banking options and customer support. Lucky Red Casino is licensed and regulated in Curacao, although the company runs their customer support out of the UK. Despite being a relatively new casino, only established in 2011, it is run under the management of World Online Gaming, who are also responsible for Club USA and Aladdin’s Gold. This group has been operating since 2004. Their website goes into great detail in their FAQs and Cashier sections, making sure everything is clearly stated for their customers. On the whole Lucky Red Casino appears to be a company going that little bit extra to prove their legitimately in the market. This includes using the RTG casino software, the leading software package for US facing casinos. Lucky Red’s Casino lobby is smart looking and well organized. Their only Craps game can be found under the Specialty on both the downloadable and flash clients and is run using standard rules. When the game opens the graphics are great with a real authentic look to the table and all sections clearly marked making it easy to navigate. As you move your mouse around the table, areas highlight indicating where you can and cannot bet, which is very helpful if you are new to the game. Your bets can range from $1 to $100 and Table limits for all bets go up to $1000. You can choose how much to initially bet by clicking a chip denomination at the bottom of the screen. This adds that amount to your bet and they can then be reduced by clicking on the stack. To place your bet just click on the area in which you want to bet and these can be removed by using the clear button. If you are unsure of the maximum you can bet a pop-up displays it in each section if you hover over with the mouse. The table offers 3x odds on your pass line bet once you get into the point round. Pay-outs for points are 7:6 for 6 or 8, 3:2 for 5 or 9 and 2:1 for 4 or 10. This gives a blended house edge of 0.61% on Pass Line bets and 0.46% on Don’t Pass. Field bets can be placed for even money, with 2 receiving double pay-outs and 12 receiving triple. Other odds are for bets are clearly marked on the table. Lucky Red offers a 400% Slots bonus up to $4000 requiring a 25% play-through, and a 100% Blackjack and Video Poker bonus up to $1000. Unfortunately neither of these applies to the Craps games. Craps players can get daily cash back bonuses on all games up to 25% along with daily deposit bonuses. 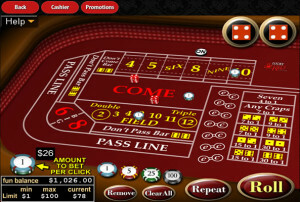 These change between different games although at least three times a week you can find a bonus which applies to Craps. The bonus differs between from a straight $20 added to your account to 70% match bonus up to $1000. These tend to require a 25x play-through on deposits and bonuses. 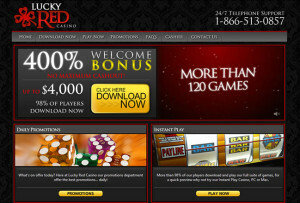 Lucky Red’s downloadable client offers over 120 games, although most of these are slots and video poker games. 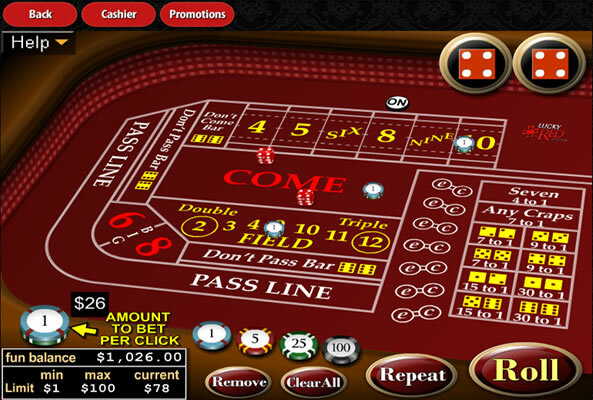 All of the traditional casino table games are available, including Blackjack and Roulette and there are many progressive jackpot variations to choose from. Lucky Red Casino offers a range of deposit and withdrawal options depending on where in the world you are. Credit Cards are generally accepted worldwide, although you may have issues with some cards in the US, and several e-wallets are available to worldwide players. Under the Cashier page on the website, you can clearly see all the methods accepted for deposits and withdrawals, along with minimum and maximum limits. There are also time frames listed for all options, some which include instant withdrawal options. Lucky Red state they pride themselves on fast payments and process all by the next working day, although account verification is needed. Customer support is available 24/7 via email, a toll-free US phone number or Live Chat which is very fast, friendly and efficient. Lucky Red Casino has taken many steps to ensure they are transparent and helpful to customers. While they go into detail on their website about banking methods under the cashier section and other information in FAQs, their customer support is great if you run into other difficulties. The Craps game they offer, powered by RTG is one of the most authentic ones you can find on the internet and their whole package casino looks top quality and professional. Highly trusted, quality, recommended online casino. Craps players can enjoy daily cash back bonuses. Over 120 casino games to choose from. Large welcome bonus doesn't allow play on Craps.